"Hmmm..." I said to myself. This looks like it would be a great coin quilt. 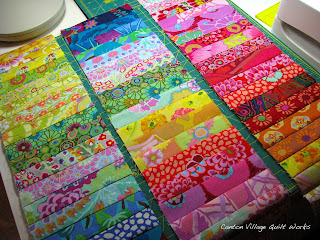 So I kept on sewing scraps and ended up with three rows! I liked it! So I put it on the floor (design wall still occupied with another project) to lay it out with white to see how it would look. Of course, at this point my helper, Pavi, came by to inspect. I think he liked the white. He laid down on it for his stamp of approval. Thanks, Pavi! So I sewed the rows together with the white and, VOILA, my quilt back. NOT!!!! I just thought it was too pretty to be the back, so now I have another quilt front! I just thought it was too pretty to be on the back. 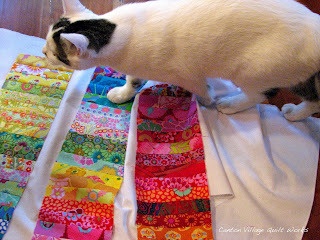 Plus, the way I have decided to quilt the other top, this backing just wouldn't work out. So the initial intention was a good one, but turned out better. At least I think so! 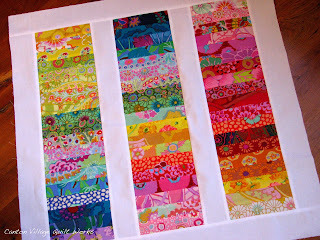 So the rest of this week, I will be spending tying up loose ends before I go to Quilt Market!! I am getting excited! In the meantime, I have created a new Etsy treasury for you to feast your eyes. You can see it here, but hurry, it expires on Thursday. 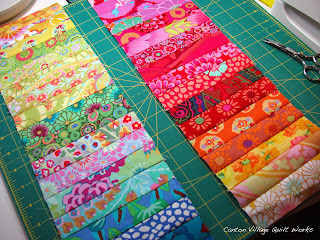 It is all QUILTS!! 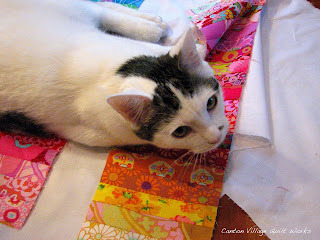 Also, of note, don't forget Amy's Blogger Quilt Festival begins this week! Be sure to have your quilts ready for posting. 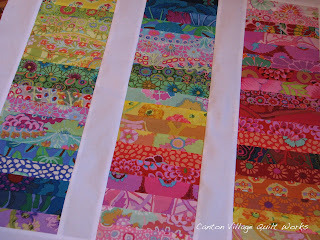 And for more inspiration, check out the new quilts uploaded to my gallery. I think you will like.